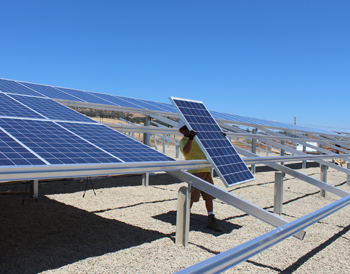 Long-term production guarantees and operation and maintenance (O&M) contracts have become standard fare in large solar projects. Typically, engineering, procurement, and construction (EPC) companies are on the hook when solar systems fall short of production assurances. Additionally, utility-scale developers are mindful of the financial impact that long-term system output has on the viability of a project. To safeguard against panel under-production or overall system failure, owners and operators are maximizing the technologies available to check and double-check their solar products and equipment. 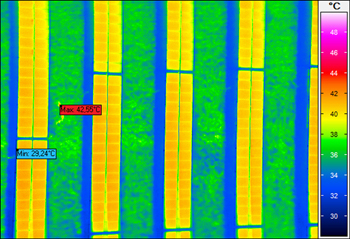 More and more, EPC’s are using infrared images to analyze underperforming arrays, and the pictures are showing hot spots—lots of them. A hot spot indicates an underperforming module, and is typically the result of a cracked cell or failed junction box. Under infrared inspection, hot spots stick out like a sore thumb in an otherwise healthy array. Most module manufacturers have quality-control procedures in place to ensure any panels leaving their factories are devoid of hot spots. While Crystalline Si cells are inherently sensitive, manufacturers maintain that micro-cracks (which can lead to hot spots) are often the result of thermal expansion cycles that cause mechanical stress on the cells. Manufacturers are also acutely aware that cell damage can occur during the installation process, when installers stand or kneel on the modules to affix clamps. Today’s solar companies are looking for ways to minimize cell damage and maximize production by reducing any and all forces on modules, and they are quickly discovering that one key factor in mitigating risks and boosting efficiencies is a well-designed mounting structure. 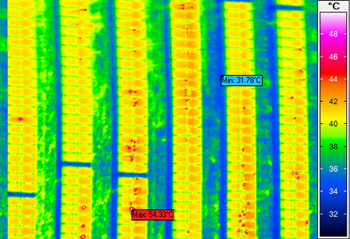 Comparing systems Figure 1’s thermal images feature two different ground-mount arrays, both three years old. One is mounted with a clampless mounting system, and the other with a traditional clamping system. The size, design, module brand, location, and year built are the same for each array. The pictures were taken on the same day with an ambient temperature of about 90° F (32° C), and an average module temperature at both arrays of about 106° F (41° C). In these images, the clampless system is homogenous while the clamping system shows visible red dots (hot spots). In typical, large-scale solar fields, a single hot spot will reduce production on an entire string of modules. A closer look at the clampless system suggests two compelling theories as to why there are no hot spots. First of all, the clampless or “lay-in” system enables modules to be inserted from underneath the array (in ground mounts; see Figure 2). As a result, installers aren’t forced to straddle or kneel on modules to attach mid-clamps, eliminating the potential for point load stress from bodyweight. Secondly, mechanical stress from thermal expansion (as the array heats and cools every day and every season) is alleviated by the absence of clamps. When modules can rest stress-free in rail profiles, they’re better able to withstand expansion and contraction cycles. For example, the linear coefficient of expansion on a 10-foot row of modules in a 0° F to 120° F (-18° C to 49° C) temperature zone dictates that aluminum will expand or contract approximately 3/16″, and module glass approximately 1/16″. When clamped, the aluminum rails put force on the module through each weather cycle. 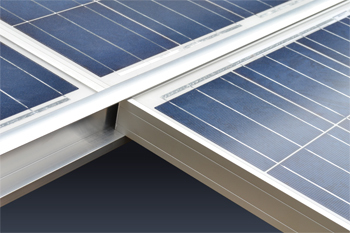 Clamp-free module mounting Invented nearly two decades ago by solar engineers in Germany, the benefits of clamp-free module mounting were immediately apparent to the designers, and resulted in less stress on modules, faster installation, and better aesthetics (see Figure 3). Over the last 20 years, the beneficial effects of stress-free insertion rail systems have been realized by many EPC’s and solar project owners. As the solar industry matures at a rapid pace, these types of potential benefits are now being measured with greater urgency and accuracy using new tools like thermal imaging. Of course, mounting systems have always been an essential part of a project’s balance of system (BOS), but now developers, financiers, and EPC’s are paying closer attention to how the structure impacts system production and the bottom line.